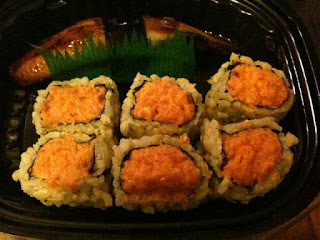 I wasn’t exactly hungry the other day- just having a serious craving for a spicy tuna roll. I didn’t feel like going out to get any so I looked up on Seamlessweb for sushi places with a minimum delivery below $20. To be honest there aren’t a whole lot but Amber Sushi on 3rd avenue showed up for $10 so I decided to give it a shot. I ordered one spicy tuna roll and a piece of eel. I had never tried Amber before but it got some decent reviews and I was excited they had a brown rice sushi option. My meal was surprisingly quite awesome. The rice to tuna ratio was spot on, the tuna itself was very tasty and the eel was a nice big piece with a little caramelized top. I had low expectations going in and this meal pleasantly surprised me.